We're taking a look back at the fine art competitions that originated in ancient Greece and were revived as part of the modern Olympics from 1912 to 1948. 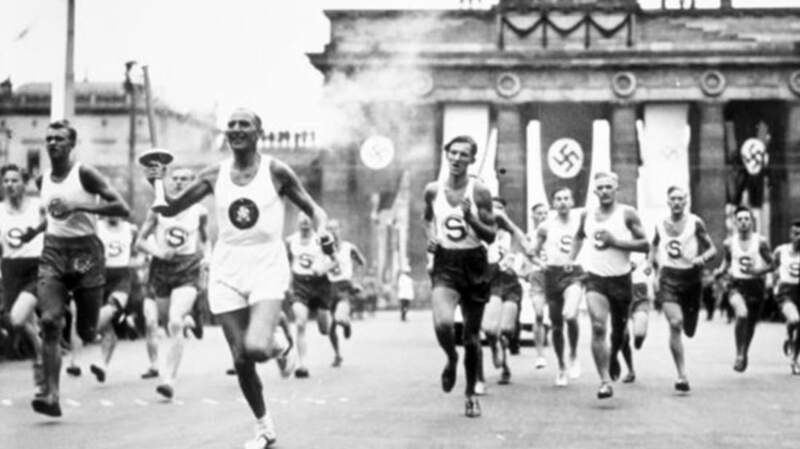 When Adolf Hitler assumed power in January 1933, the future of the 1936 Berlin Games was suddenly in doubt. Joseph Goebbels, Hitler’s Minister for Public Education and Propaganda, convinced the chancellor that the Games were an opportunity to shape Nazi Germany’s image and showcase the country’s athletic prowess and shape. The 1936 Games would go on as planned. One of the changes the German Art Committee proposed for the 1936 Olympic art competition was the addition of a Works of the Screen category. Berlin Organizing Committee president Theodor Lewald proposed the idea in a letter to Baron Pierre de Coubertin, who had continued to serve as an honorary head of the IOC following his retirement as president in 1924. Coubertin respectfully denied the proposal, which would have welcomed “purely documentary films and films of general propaganda” and excluded theatrical submissions. The IOC also denied requests to add dance and creative gold and silver smithing to the program. Germany moved ahead with plans to host a dance competition concurrent with the Games. Legendary American modern dancer Martha Graham was invited, but she declined. “So many artists whom I respect and admire have been persecuted, have been deprived of their right to work, and for such unsatisfactory and ridiculous reasons, that I should consider it impossible to identify myself, by accepting the invitation, with the regime that has made such things possible,” Graham wrote. The proposed competition became an international dance festival, with every participant awarded a diploma. Spain and the Soviet Union boycotted the Games and low participation numbers in the art competition from other countries prompted Germany to extend the deadlines for submitting works. The 1936 art competition featured roughly half the total number of entries that had been submitted in previous years, but managed to attract 70,000 visitors. According to Richard Stanton, author of The Forgotten Olympic Art Competitions, Germany considered building a full-scale model of the Temple of Zeus to serve as the entrance to the art exhibition, but the plan was scrapped due to budget concerns. In a move that must have delighted Coubertin, Germany arranged for several of the medal-winning music compositions to be performed by the Berlin Philharmonic Orchestra in a concert at the end of the Games. The 1940 Games were scheduled for Tokyo, moved to Helsinki in 1938 and then canceled entirely when the Soviet Union invaded Finland in late 1939. World War II also led to the cancellation of the 1944 Games, which were to be held in London.